I made a ton of mini pancakes at like 4:30 in the morning. I woke up to nurse and just could not get back to sleep! 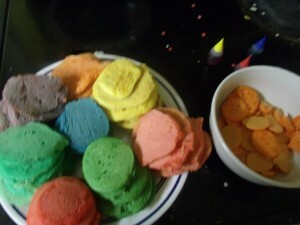 I figured to make them, then go back to sleep until it was time for breakfast and then getting ready for the parade. This all worked out wonderful for timing. Livy and Abigail enjoyed them greatly. I know the picture shows a ton of mini pancakes but I made enough for everyone that lived in the house at the time. This entry was posted in Cooking, Holidays. Tagged meals, St Patricks Day. Ever see a deer like this?